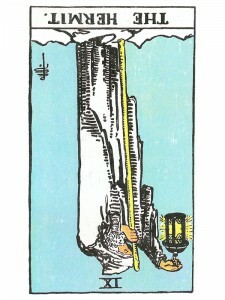 The Hermit (R) says you are creating too much resistance, refusing to accept or listen to good counsel and this is creating the tension you are experiencing within yourself. Do not allow your “ego” to get between you and your good, common sense. Swallow your pride, stop your activities and take the time to think things over. Make your plans carefully before moving forward – be receptive to the times when you see that there is a lack of communication. Recognize that you may be consciously trying to cut yourself off from others – trying to tell yourself that no one seems to care. You are only avoiding the responsibilities of doing something with your life when you hang on to meaningless activities or try to imitate enthusiasm. Change your attitude and things will begin to look better. You can not soar like the eagle you are, when you are bound up in a cage. Become involved in life again. It is not your outer circumstances that must change, but the way you look at them that makes the difference. Man is anything but a desert unless in the process of separating in order to find himself he gets lost – he must then depend on the light of another, ultimately in grace, to bring him back. What are you doing with the time you have to yourself? What are you looking for or what do you need to know? Who can help you find out? What concerns about time do you have? What do you need to keep silent about? What would be the prudent thing to do? In the first position: Whether or not you are a priest – you will serve communion to your fellow citizen. In the second position: Should you need to do something very out of the ordinary, you may have trouble getting the resources you need. In the third position: Truth is to be presented in a package that is highly palatable – do not miss it, for it has been cooked especially for you. Be patient – this is a group to which you want to listen and participate with. It will become more concrete with time; that is why you are to be involved. In the fourth position: If acted on too early, the passion for formal religion may prove to be less than long lasting. At another extreme the passion may be a hatred for a given belief system. In the fifth position: Do not waste your time or the horses’ in trying to get them lined up precisely before you think you can act. Life is an organic process. In the sixth position: Ask yourself whether your belief system is opening your heart or closing it. In the seventh position: Do not ask questions if you have none or forget to ask them when you have one. In the eighth position: You can lead a horse to water but you can’t make him drink – as it should be. In the ninth position: Your heart will help you balance between belief and non-belief, between faith and doubt, between yourself and your group. In the tenth position: Much of what you receive will be for others.